A paradise for wine lovers! The Winery Hotel is one of our most distinctive projects to date. With its visionary concept focusing on the increased interest in wine and winemaking, the hotel offers an experience for each visitor. The aim is for every guest to know more about wine when they leave than when they arrived. The hotel came into being when a shared passion for wine brought the Söder family of hoteliers and the Ruhne family of winemakers together. Ejnar Söder, one of the hotel’s founders. For us it was more about the passion to create something unique and different. We worked on the project together with experienced companies, including construction partners Veidekke and Arcona and architects Archus Arosia. 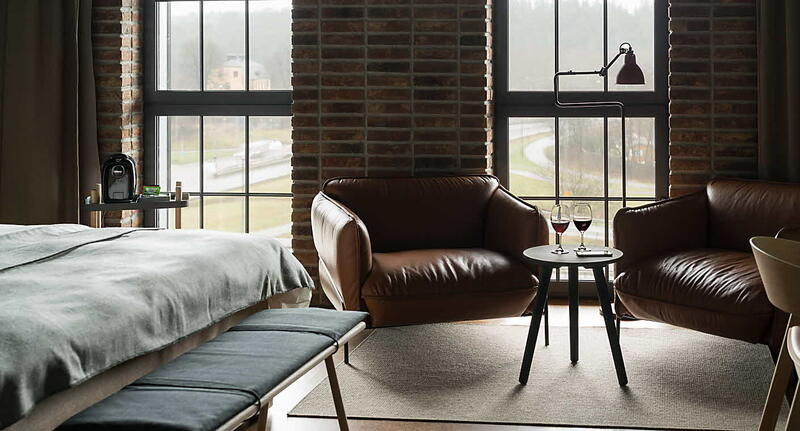 The hotel is attracting visitors from all over Sweden with its 184 rooms, own winemaking, wine bar, delicatessen, restaurant and Sweden’s largest winery offering tastings of wines from all over the world. Even the hotel’s design is inspired by winemaking. The first thing hotel guests see is the wine store in oak casks behind a glass wall in reception. The exterior’s industrial feel contrasts with an interior that reflects influences from the rural charm of Tuscany and urban Brooklyn. The wine production is overlooked by the Ruhne family from the Terreno vineyard in Tuscany, the family is also a partner in the hotel. 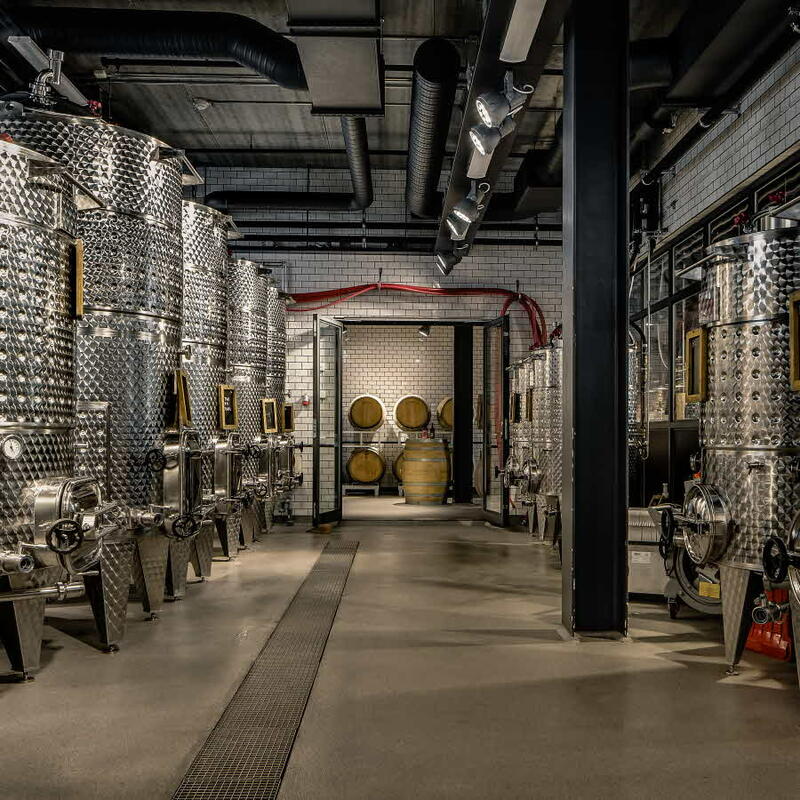 For quality assurance, The Winery Hotel has hired as a consultant, one of Italy’s leading oenologists, Luca Rettondini. The hotel itself produces about 10,000 bottles a year. The winery is at the heart of the hotel and sets the tone for both the architecture and interior design. 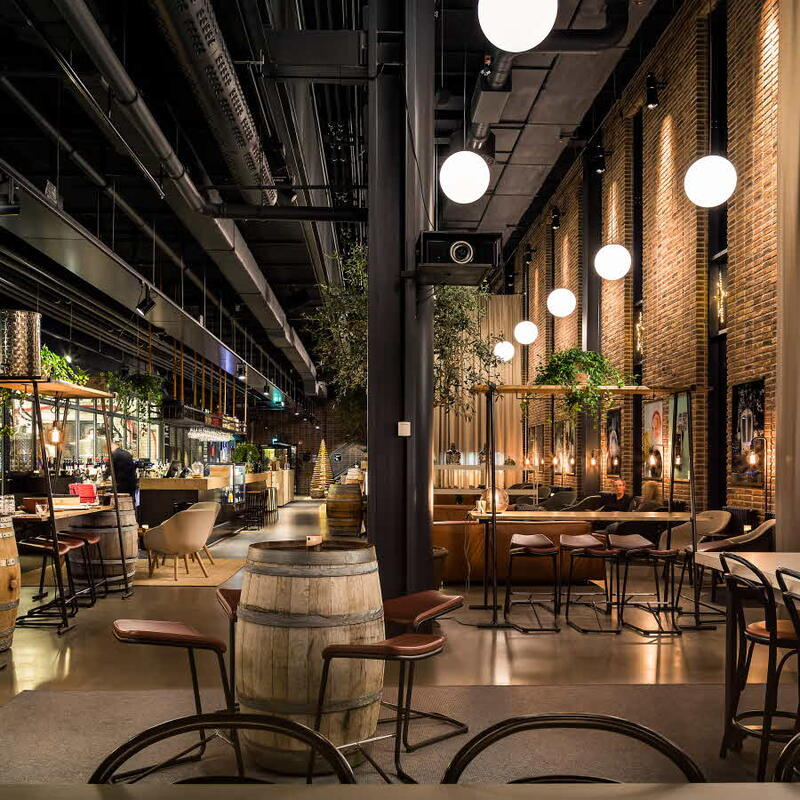 Polished concrete floors and brick walls inspired by the 20th century industrial era are paired with modern lighting and furnishings, resulting in cutting-edge design. The hotel’s interior is designed to enhance and bring out the character of the building. The lobby’s huge, airy windows and generous ceiling height of over six metres, combine with materials chosen to emphasise the industrial elegance of the architecture. The building’s architecture, with brick features and large glass wall sections, is reminiscent of a vast food hall that never sleeps. The interactive concept in a food hall setting focusing on events is totally new. 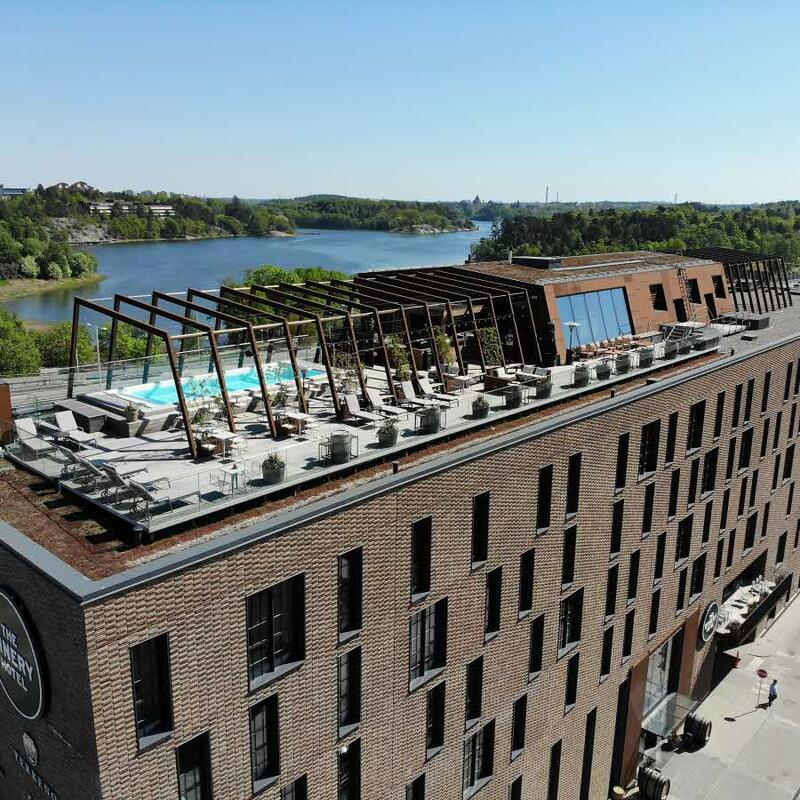 On the hotel roof, which offers views over Brunnsviken and Hagaparken, you’ll find hotels most exclusive meeting room, Winery Rooftop Meeting. 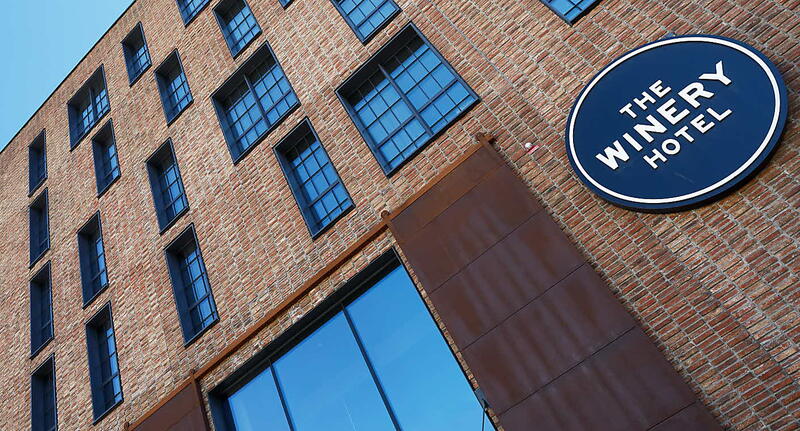 Would you like to know more about The Winery Hotel? Click on the link below to read more about it or book a room.